The Invacare Matrx VI Cushion is designed to provide skin protection and positioning for individuals at moderate to high risk of skin breakdown. The unique three part foam construction targets skin protection where it is needed most, and features excellent stability, support and comfort. Outer cover - Moisture resistant and breathable. Includes slip resistant base, hook and loop fasteners, lifting strap. Available in black and Kid*ab*ra print. Inner cover - Moisture resistant. Easily wipes clean. Zippered cover allows access for cushion modifications. Visco foam insert - Molded visco-elastic foam ischial relief insert. Anatomically targeted to ischial/sacral area. Provides immersion to sensitive bony prominences. Bottom layer - Firm (ILD) High Resilient (HR) foam for support and durability. Trochanteric shelf provides stability to hips. Waterfall front edge. Rear radius for sacral support. Drop Base - Includes built-in drop base, drop hooks, DuraClip fasteners. Allows adjustment of seat angle. Pelvic Obliquity Kit - Easily installed on all Invacare Matrx Vi/Kid*ab*ra-Vi cushions/bases. Accommodates 0.5" or 1" obliquities. 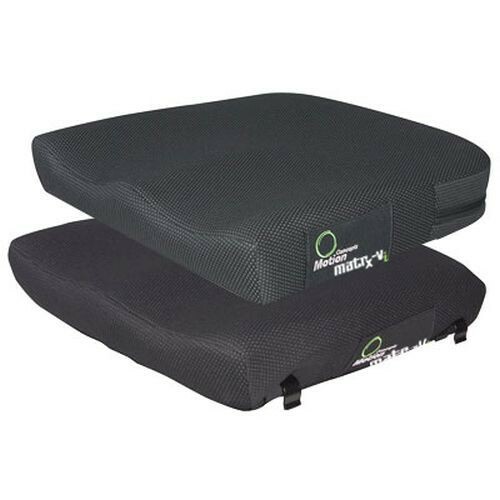 Seat Width:14", 16", 19", 20", 22"
The Matrx Vi, a skin protection and positioning cushion is a multi-density contoured foam cushion that provide support as well as maximum pressure distribution. This is a lightweight option that is stable for transfers and is maintenance-free. The outer cover is mesh tacks, a breathable outer cover with moisture-resistant inner barrier and a protective inner cover. The base layer is a high-resilient foam designed to provide support and stability. The base is contoured to provide alignment for the thighs with abduction and adduction support. The posterior foam base is built up on the sides to form a trochanteric shelf to support the lateral aspects of the pelvis in order to suspend the ischial tuberosities in the lower center of the cushion. There is also a pre-ischial shelf in the base built up to maintain the position of the pelvis behind it. The top green foam layer is constructed of soft, high-resilient foam. This top layer is molded to match the contours of the base foam and serves as a weight distribution layer. The top foam layer wraps over the front of the cushion to provide a soft protective edge. Important, if the customer foot propels or tucks their feet under them with 90 degrees or more of knee flexion, which they may do during transfers. Imbedded in the underside of the pelvic target is a Visco-elastic foam insert, which provides enhanced immersion of the ischial tuberosities and coccyx. This insert has tapered edges, which makes the transition gradual preventing a hotspot along those edges when pressure mapping is performed. Options include a dartex outer cover, custom leg length discrepancy modifications, solid base, all available for an up charge. A pelvic obliquity kit is also available and is designed to accommodate a half-inch or one-inch obliquity.